The Apacs Feather Weight 200 racket is light weight racket produced by Apacs. The Armor High Speed Frame design and the super light weight of this racket makes it Extremely Super Fast! The racket was developed with the new "High Speed Frame" which increases the Speed in the swing, and overall improve execution with Power and more Control. (* High Speed Frame design is an aerodynamic shape frame designed to reduce drag on the frame during straight on swing or hit). 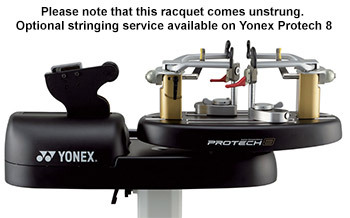 The Racket frame was developed with the new 'Reinforced Structure' which enable string tension of 30lbs. A rare feature for light weight (7U) rackets. The racket is a flexible shaft racket that will deliver more power even for beginners, as it will have a kind of sling shot effect. Due to the light weight and high speed frame design of the racket, Feather Weight 200 is an extremely fast racket and is developed to suit players who wants more SPEED.